The following includes visual representations of gene transfer elements, which are for educational purposes only. Gene transfer is a novel technology that is under investigation as a potential treatment approach for Duchenne. To our knowledge, no gene transfer products have been approved in the United States or the European Union for the treatment of Duchenne. Genes are segments of a person’s DNA that determine a person’s traits, like eye color. They also direct cells to create working proteins that make the body work properly. Sometimes the information in genes can change. These changes are called mutations. 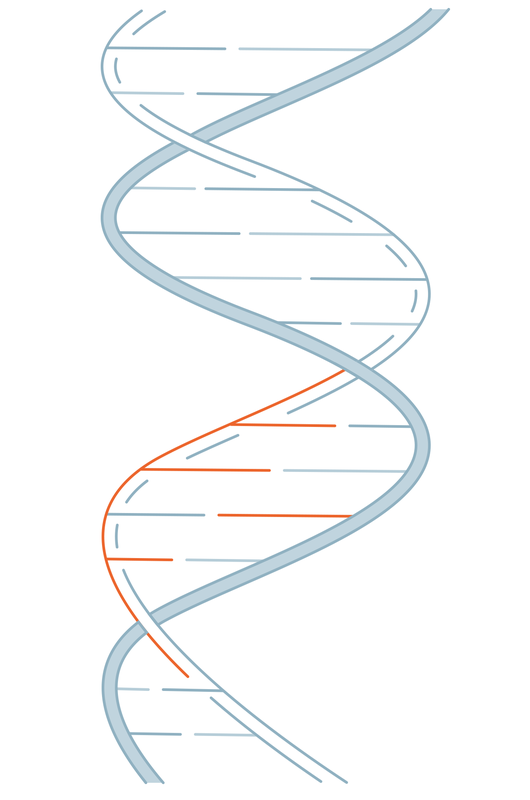 Genes can develop new mutations, or existing mutations can be passed down from parent to child. 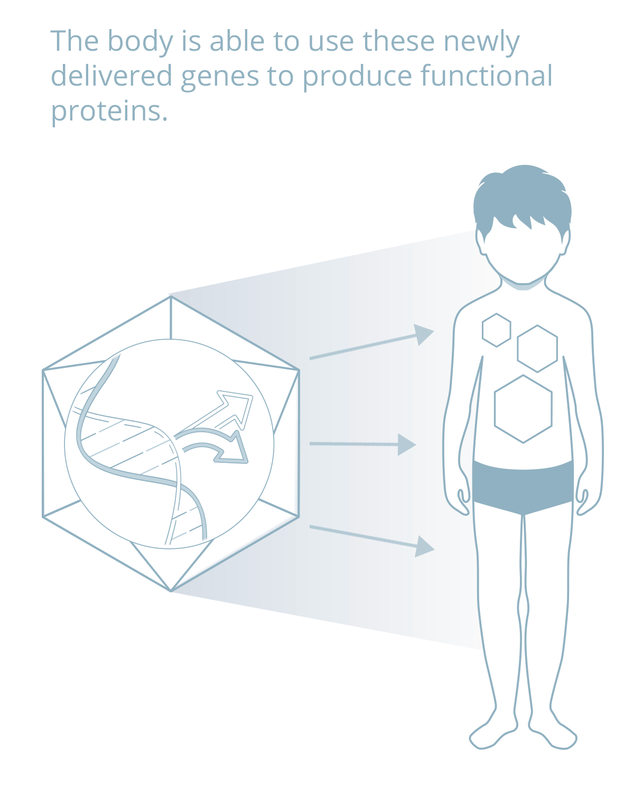 While most mutations are harmless, some can prevent the body from producing critical proteins, resulting in serious genetic diseases like Duchenne muscular dystrophy, or Duchenne. 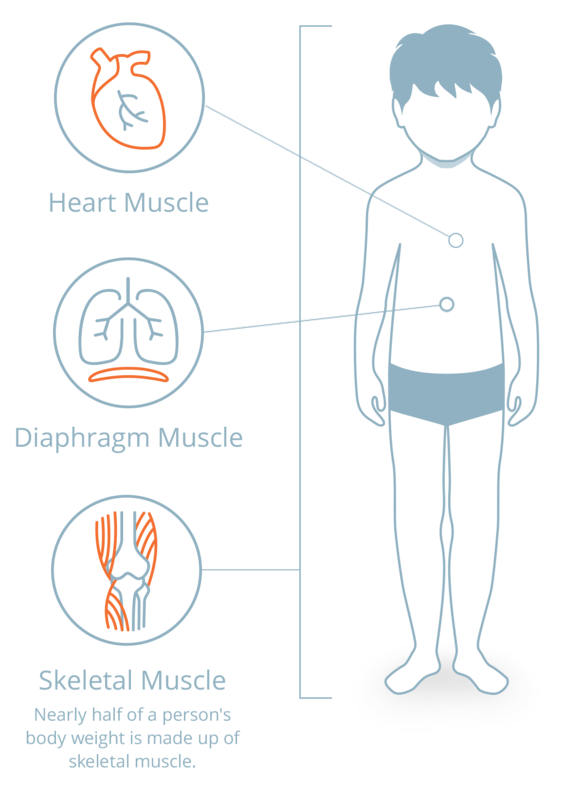 Duchenne is caused by mutations in the dystrophin gene, which supports muscle health and function. These mutations result in the body’s inability to produce normally-functioning dystrophin protein, which is essential for muscle strength and protects muscles from injury. 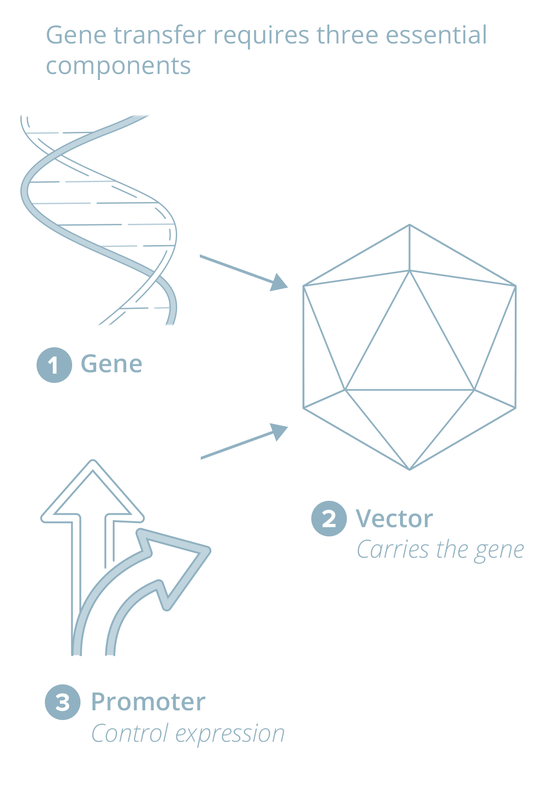 Gene therapy is an experimental technique that uses genes to treat or prevent disease. The goal of gene therapy is to replace or correct missing or faulty genes. One gene therapy approach is called gene transfer. In this approach, a new, functional version of a gene is delivered to the body to make up for the faulty one that is causing disease. Researchers have developed several types of vectors over past decades. One of the most well-studied vectors is called adeno associated virus, or AAV. AAVs are small viruses that are not known to cause disease, and when harnessed for use in gene transfer, can enable widespread delivery of genes to the body. 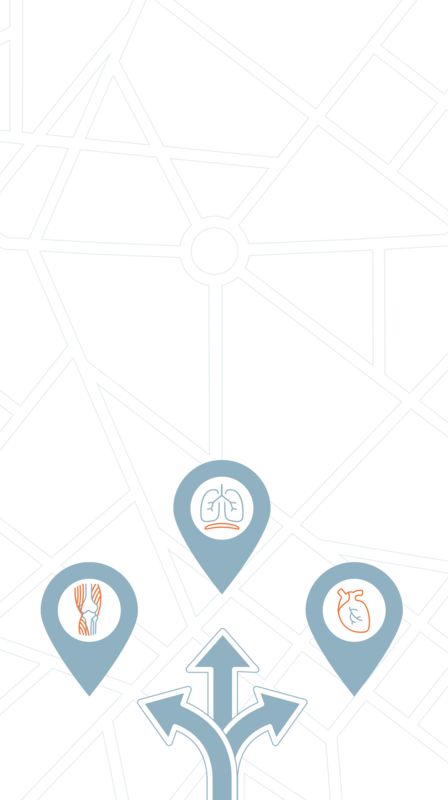 AAVs have shown potential in Duchenne because they are able to target muscle tissues that are involved in Duchenne, including the heart and diaphragm. In Duchenne, however the dystrophin gene is too large to fit into an AAV vector. To address this challenge, scientists designed smaller, “microdystrophin” genes, to fit into the vector. 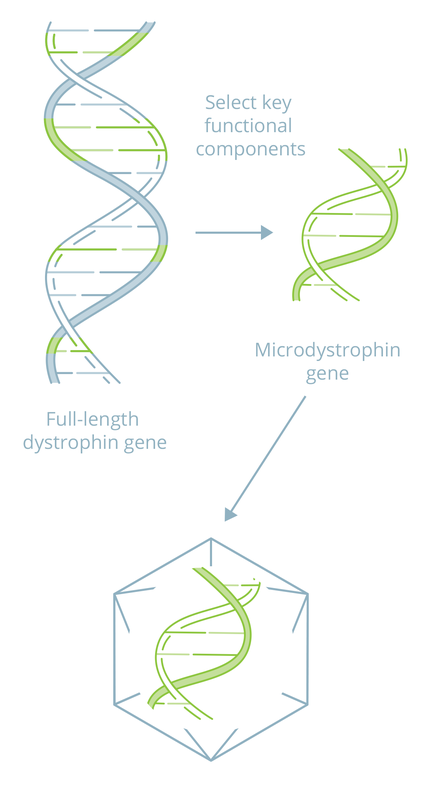 These microdystrophin genes retain key elements of the full-length dystrophin gene, which may enable the body to produce a smaller but functional form of dystrophin protein. The muscle-specific promoter helps the body make microdystrophin protein only in the skeletal muscle, diaphragm and heart. The AAV containing the promoter and microdystrophin gene is given once through an IV into the bloodstream for widespread distribution. While gene transfer is a promising approach for Duchenne, there are still many unknowns, as well as potential risks and limitations. There may be immediate and long-term adverse effects that have yet to be understood and may be life-threatening. Some patients may have pre-existing antibodies to AAV, meaning they would not be able to receive AAV-mediated gene transfer. If gene transfer is approved by regulatory authorities, it is not known how long any potential effect would last. It is not known if a second administration of gene transfer would ever be possible. Patients who participate in any gene transfer clinical trials may not be eligible to participate in clinical trials for other investigational candidates. The hope for gene transfer in Duchenne is that the production of microdystrophin in the muscles will protect them from further injury and maintain their function. If successful, gene transfer may have the potential to slow or halt the progression of Duchenne regardless of a patient's specific mutation. The genetic material that is passed from parent to child and provides the “blueprint” for making all the proteins in the body. The instructions in DNA are unique to an individual (except identical twins) and influence characteristics like eye color, height or risk of developing certain diseases. A change in the information carried in genes. Some mutations are harmless but some can cause disease. The basic building blocks of your body’s tissues that carry on the essential functions of life. Cells come in a variety of shapes and sizes depending on the tissue (muscle, skin, liver, etc.) and are specialized to perform a variety of different jobs within the body. Each cell contains its own machinery (called organelles) to do the work needed to keep the cell healthy and functioning properly. Components of a cell that are made using the instructions in DNA and are assembled to build cells and make them work properly. Information in a person’s DNA that provides instructions for making proteins that perform different functions in the cells of the body. 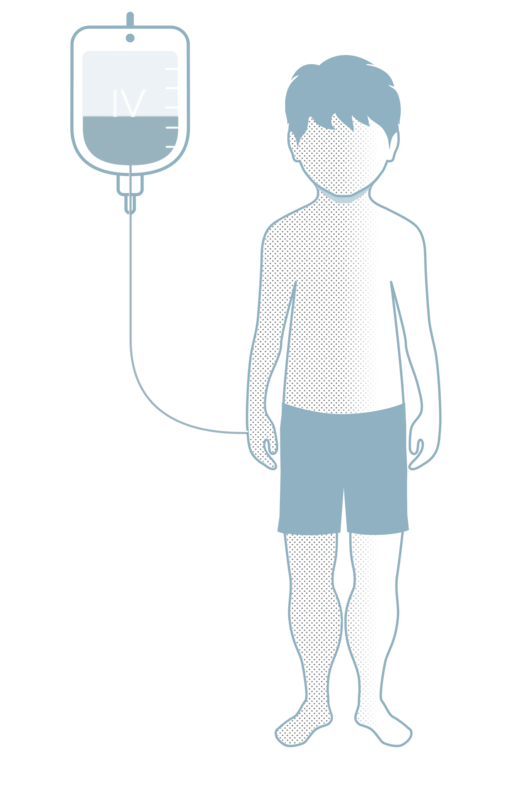 Duchenne is a a genetic, muscle-wasting disease predominantly affecting boys with symptoms that usually manifest between three and five years of age. Duchenne is a progressive, irreversible and ultimately fatal disease that affects approximately one in every 3,500 to 5,000 live male births. Duchenne is caused by mutations in the dystrophin gene, which result in the absence or near-absence of dystrophin protein. Without functioning dystrophin and certain associated proteins, muscles suffer excessive damage from normal daily activities and are unable to regenerate, leading to the build-up of fibrotic, or scar, and fat tissue. There is no cure for Duchenne and, for the vast majority of patients, there are no satisfactory symptomatic or disease-modifying treatments. A protein that is critical for maintaining the health of muscle cells and protecting them from injury when muscles contract and relax. 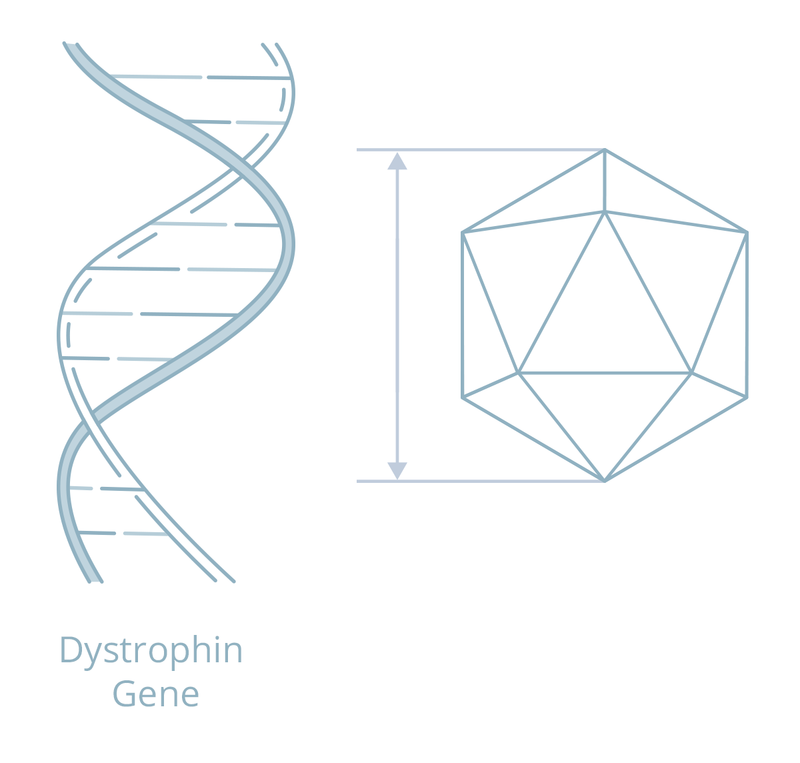 In Duchenne muscular dystrophy, a defect in the gene for dystrophin results in the absence or near-absence of dystrophin protein in muscle. Gene therapy is an experimental technique that uses genes to treat or prevent disease. The goal of gene therapy is to replace or correct missing or faulty genes. One gene therapy approach is called gene transfer. A type of gene therapy in which a new, functional version of a gene is delivered to the body to make up for the faulty one that is causing disease. A naturally occurring virus that is modified for use in gene therapy to carry new DNA to cells. AAV is not known to cause illness in humans. A tiny particle made up of proteins and DNA or RNA that infects cells. An engineered gene that contains the instructions to make a smaller functional form of dystrophin protein. Microdystrophin gene transfer is currently being researched as a possible gene therapy for Duchenne. Muscles that work together with our bones to make our body move and give it strength. A scientific study of an investigational product (such as a drug or vaccine) to see whether it is safe and works as intended (efficacy), conducted in people who consent to be in the study. Regulatory agencies like the US Food and Drug Administration (FDA) or European Medicines Agency (EMA) that review and approve new treatments, vaccines, etc. © 2019 Solid Biosciences Inc. All Rights Reserved. Solid Biosciences Inc., is a Cambridge, MA-based life sciences company committed to solving Duchenne muscular dystrophy and improving the lives of patients. Solid is currently developing gene therapies, disease-modifying therapies, and assistive devices, all targeting the many facets of the disease. The characterization of the discovery and development efforts on this website, as well as the expectations associated with them, are reflective of the current state of development and may change as the Company progresses.